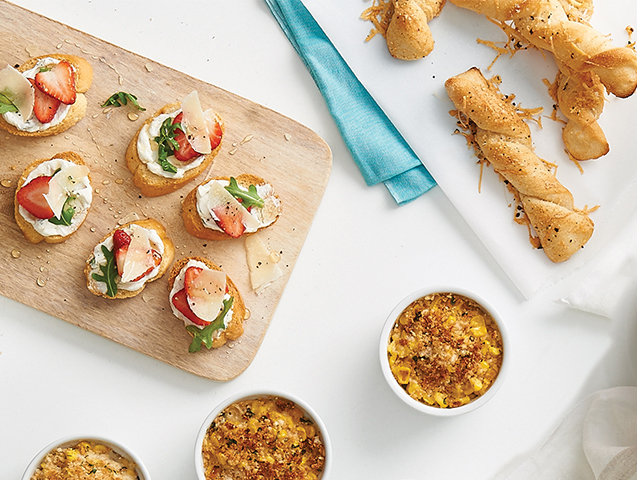 Sure you can use regular shredded cheese for these toasts, but we're telling ya, it's hard to beat fresh Mozzarella. Preheat a charcoal or gas grill for direct cooking over medium-high heat. Add butter to a microwave-safe bowl. Microwave on high for 30 seconds or until melted. Stir in garlic. Brush garlic butter on both sides of each bread slice. Grill for 3 minutes or until crisp and golden, turning once. Cool on a rack. Thread tomatoes on skewers; brush with olive oil. Grill for 2 to 3 minutes or until tomatoes are slightly charred, turning once. Top bread with mozzarella, pesto and tomatoes. If desired, garnish with parsley. Zippy, fresh flavors of this bubbly prosecco will harmonize with bright herbal qualities.